There are so many factors like cost of production, technology, climatic situation, political situation, taxation policy, prices of substitutes, etc. which can change the supply of a commodity while price remaining constant. The change in quantity supplied of a commodity due to change in the above mentioned factors at constant price, is called shift in supply or rise and fall in supply. There are two types of fall in Supply. In the above schedule, price $6.00 remains constant and Qx decreases. According to the above schedule the fall in supply is explained in the diagram. 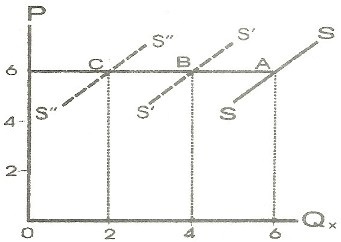 SS is the original supply curve of the seller, the price $6 remains constant and supply curve shifts from SS to S'S' and further to S"S". This type of shift in supply is called the fall in supply. In this type of fall in supply the price of a commodity increases, but the quantity supplied remains constant dug to some other factors and does not take any response of increase in price. In the above schedule Px increases from $2 to $6 but the Qx = 6 kg remains constant at each increase the price of 'X'. This type of fall in supply is explained by the diagram. 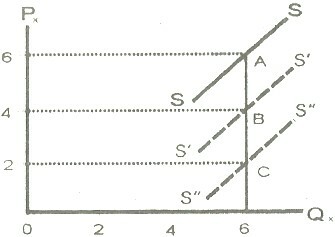 SS is the original supply curve. Px increases from $2 to $.6 but the quantity supplied remains constant. So that the SS shifts to S'S' and also to S"S". There are two types of rise in supply. When the Px remains constant and quantity supplied increases due to some other factors, it is called rise in supply. It is explained with the help of the following schedule. In the above schedule, price $6 remains constant and Qx increases. According to the above schedule the rise in supply is explained in the diagram. 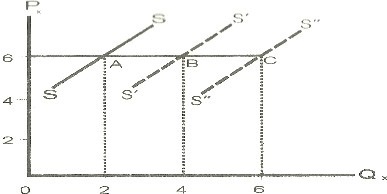 SS is the original supply curve of seller, the price $6 remains constant and supply curve shifts from SS to S'S' and further to S"S". This type of shift in supply is called the rise in supply. In this type of rise in supply, the price of a commodity decreases, but the quantity supplied remains constant due to some other factors and does not take any response of increase in price. In the above schedule Px decreases from $6 to 2. but the Qx = 6 kg remains constant at each decrease in the price of 'X'. This type of rise in supply is explained by the following diagram. 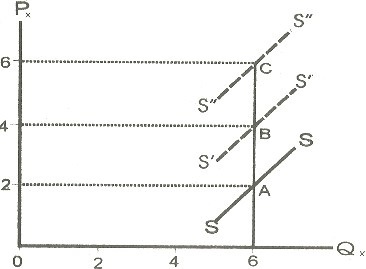 SS is the original supply curve Px decreases from $6 to $2 but the quantity supplied remains constant. So that the SS curve shifts to S'S' and also to S"S". (1) Change in Factors Prices. There are various factors which are used in the production of commodities. The prices of those factors affect the cost of commodity. If the prices of the factors increase, the supply of a commodity decreases due to increased in the cost of production. And if the prices of these factors decrease, it will result in decreasing the cost of production and the supply of a commodity will increase. The technique of production of a commodity also affects the cost of production. New inventions or improved methods of production decrease the cost of production; it will result in the increase in supply of a commodity and the supply curve shifts upward from its original curve. (3) Means of Transport and Communications. The means of transport and communications are roads, railways, aero planes, ships, telephones, TV., radio etc. These means are important factors for economic growth of an economy. By the provision and improvement of these means, people can sell their products in all markets in a short time. Especially, the supply of perishable goods (Fruit, vegetables) can be ensured due to fast means of transport and communication. The weather conditions affect the supply of agricultural products. There will be possibility of bomber crops due to favorable climatic conditions. On the other hand, the supply of agricultural products decreases in the presence of natural calamities or unfavorable weather conditions, e.g. if rain is not timely and plentiful, it will cause lower the supply of crops. governments, weak political institutions etc. The stable government system is necessary for a stable economy. The Taxation policy of a government directly affects 1he supply of locally manufactured goods as well as imports. If government levies heavy taxes, the supply of imports decreases. This policy will also affect the investment progress. The supply curve shifts upward or down ward by decreasing or increasing the rate of taxes. The goal of a firm is to maximize its profit. If an entrepreneur expects higher profits in the future, he will take the risk of more investment and the goods are produced on large scale. It will result to increase in the supply of commodity and the supply curve will shift upward. If scientific methods are developing in a country the cost of production is decreasing due to the new discoveries and inventions. Then the quantity supplied will increase. If the sellers are prepared to organize their union or cartels and do not compete with each other the prices will have no tendency to fall inspite of decrease in supply. The government announces its trade policy every year. If the government announces some concessions in trade policy, then the quantity supplied increases. There is a tendency of industrial expansion in a country, the productive capacity of industrial units will increase and quantity supplied also will increase. If the. prices of substitutes decrease the purchasing tendency of buyers will divert to that commodities and the supply of commodity will decrease.